This RC Fart Machine will have everyone pointing fingers! 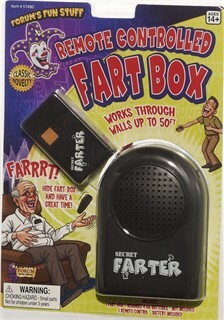 Hide the fart box and activate farts by clicking on the red button of your remote control. Shift the blame of who farted with this hilarious prank gift. Includes 4 AA batteries. Ages 14+. Availability: This Remote Controlled Fart Machine usually ships in 1 business day.